After a leisurely hike, you stand on a peak and scan the majestic horizon, your breathing slightly labored and the crisp mountain air cooling your heated skin. But among the sagebrush and desert landscape, your eyes focus on a flat, black plain that harshly breaks the desert terrain. You squint your eyes from the sun, and your heart sinks as you realize wildlife there will never be the same. It’s a test mine for the U.S. Oil Sands company. That connection to the land, the pride in Utah’s wilderness heritage and the devastation from it being destroyed, is exactly what Utah Tar Sands Resistance hopes you’ll feel on one of its excursions. UTSR, a local organization dedicated to preventing the threat of tar-sands mining, is trying a new form of activism: camping. UTSR, along with other local activism groups like Peaceful Uprising and Canyon Country Rising Tide, are hosting camping trips to build relationships within communities and explore Utah sites that will be devastated if mined for tar sands and oil shale. “Camping brings people together. It builds bonds and shared experience,” says UTSR spokeswoman Melanie Martin. On these trips, campers can participate in bird-watching, wildlife study, stargazing and yoga, but the highlight is the guided hikes. On these hikes, campers venture through canyons and hills of high desert, experiencing varied ecosystems. UTSR hopes the experience will lead to an understanding and appreciation for the rich biodiversity found in Utah, and help people form a connection with the land, as opposed to thinking of proposed tar-sands areas as remote and abstract. The campsite is located on public land but is close enough to the U.S. Oil Sands company’s test mine, as well as the decommissioned Leonard Murphy Mine, to see firsthand the ecological devastation of tar-sands mining. The Leonard Murphy Mine, which was abandoned in 1983, demolished an entire hilltop. Upon its desertion, neither the corporation nor the state took responsibility for reclaiming the land. Now, 30 years later, the land remains nearly the same as when the mine was first tested. UTSR says it’s unclear how long it will take for the land to recover, or if it ever will—and that’s what makes it so disturbing. However, U.S. Oil Sands, a Canadian operation based in Calgary that holds working interest of 32,005 acres in the Uintah Basin, claims to be “best-in-class environmental performance,” promising “rapid reclamation” and “low-energy consumption” at 60 percent less energy per barrel than traditional oil-sands developments. The solvent used in the USOS’s mining efforts is biodegradable and has been deemed by the Environmental Protection Agency as environmentally safe; it has even been used to help clean oil spills along beaches. Still, activists point out that there is nothing “natural” about strip mining. Strip mining is considered among the most invasive methods of mining. It begins by clear-cutting forest areas. Then the “overburden”—soil, rocks and peat—is stripped away. This process exposes tar-sands deposits. Massive shovels then dig pits, which in past tar-sands mining projects have been so large they are visible in satellite images. This severe land disruption removes plant life and, with it, animal life, leaving only a barren, sandy pit where biodiversity once thrived. 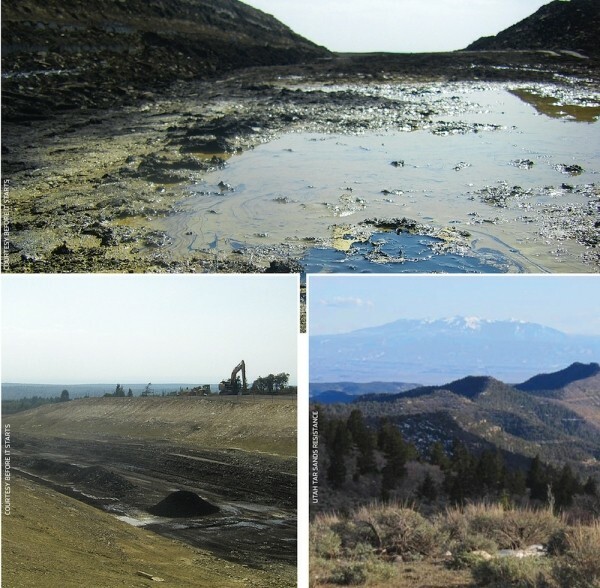 Though the consequences of tar-sands mining may be bleak, Lawrence also says the threat is not immediate, since Utah tar-sands mining is not economically viable right now due to its high cost, low net energy yield and large amounts of water needed for processing. Environmental advocates lost a challenge against the state for greenlighting the mine in 2012. That’s now on appeal, but the mine can begin operations as soon as it’s viable for the company. For now, UTSR’s main focus is not on resistance, but on building communities. UTSR members host and co-host community discussions to aid in their efforts to prevent tar-sands mining.